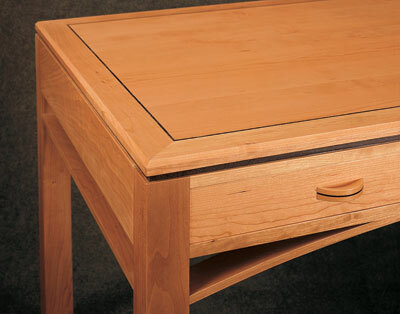 Desks and writing tables are among my favourite pieces to make. They give scope for individuality of design, provide interest and challenges during construction and create an excellent opportunity to show our customers why handmade furniture is so much more satisfying to own and use than industrially made items. When did you last come across drawers that slid open like silk to reveal the scent of cedar in a furniture store? From a workshop viewpoint, another 'plus' is that desks generally are small, so it's easy to shift them around during the making process and final delivery. The clients who commissioned this piece had a fairly good idea of what they wanted and had researched what was available off-the-shelf, before coming to me to discuss having a desk custom-made. They liked the simplicity of Shaker furniture, but wanted legs that were square in section, not tapered or shaped in any way. They wanted the desk in solid American cherry (Prunus serotina) and were open to the idea of some inlaid stringing in a contrasting wood. 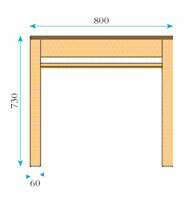 To fulfil all their requirements, it needed to be 800mm (31 1/2in) from back to front - quite wide for a desk. Wherever possible I like to visit the proposed furniture's future home. This gives me valuable information about architectural and decorative features and other furniture to which the new work might need to relate. On a more mundane level I can check to see whether the new stuff will go through the door or up the stairs... Oh yes, early on in my career I made a big table that wouldn't... In this case, access wasn't a problem but I noticed that the desk would be quite close to a radiator. 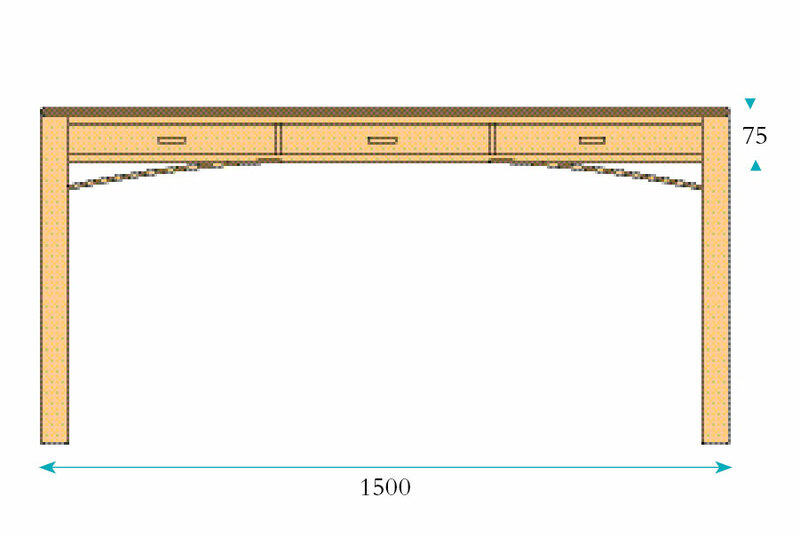 Clearly, a solid timber top, 800mm wide, so close to a source of heat would be asking for trouble, no matter how well conditioned the wood, so I realised that the top would have to be veneered, and this provided the starting point for the design. Back at the drawing board, I sketched and discarded various ideas before I arrived at the design that was accepted by the clients when I presented it. 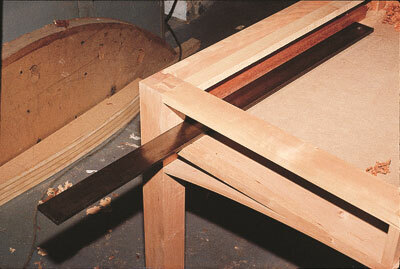 The top was to be of bandsawn cherry veneers within a solid cherry frame, delineated with bog oak stringing. A thin 'waist' of bog oak, set back from the edges, was included to give a visual separation from the rest of the desk, since the top did not project beyond the under-frame. 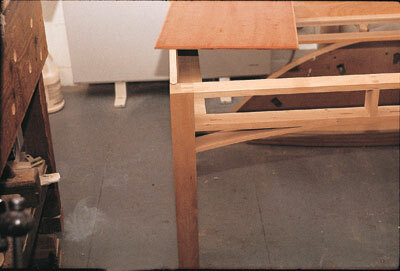 To soften the angularity of the piece and add extra stiffness to the structure, curved rails linking the front legs to the drawer rails were included. 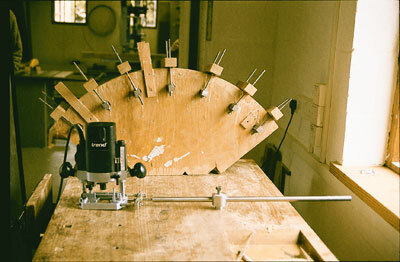 The curves were echoed in the shaped drawer pulls, which also had a strip of bog oak sandwiched centrally within them. As designers we must try and interpret our customers' needs as accurately as we can, while meeting their budget, but I enjoy giving them just that bit extra, something they might not have expected. With the commission confirmed, I ordered the cherry (Prunus spp) and prepared a cutting list and rod. I don't have the confidence of some makers who go ripping straight into their timber without having drawn out the design, or at least parts of it, full size. I'd much rather plan everything thoroughly beforehand, since it reduces the chances of error and I am sure saves time in the long run. Mindful of that radiator, I checked the moisture content of the kiln-dried cherry when it arrived, then roughed out all the parts, including the oak (Quercus robur) and cedar of Lebanon (Cedrus libani) drawer components. I stacked everything on the conditioning platform above head height in the workshop to let it all settle down and acclimatise to heated conditions - actual construction would not begin for a few months. Various short boards of ash (Fraxinus spp), rock maple (Acer saccharum) and reclaimed Philippine mahogany (Khaya spp.) 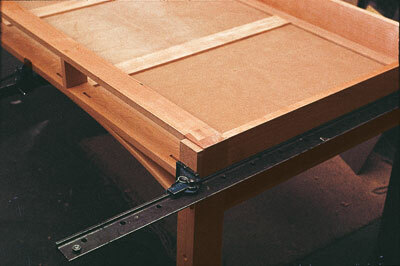 provided the drawer runners, kickers and guides respectively. Ash and maple are ideal for this since they are so hard wearing. The dust panels are 6mm MDF, dyed red on one face to give it a better appearance to anyone peering underneath the desk. The use of a manufactured board for this purpose makes a stronger job, as it can be glued rigidly into its grooves, unlike solid timber, which must be free to move at its outer edges. At this time the veneers for the top were cut to 3mm (1/8in) thick on my ancient bandsaw. 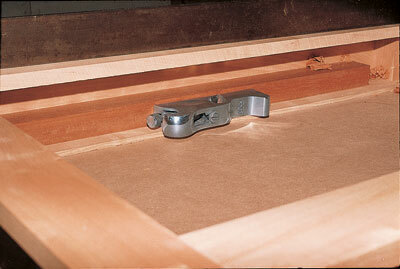 A board of unattractive appearance (black gum staining) was used for the backing veneers. For me, knowing that all the components have been safely prepared is an important psychological step in the making of any piece; it has gone from being a concept on the drawing board to a tangible item of furniture in progress. Actual construction of the desk began with machining to dimension followed by a final hand planing to the legs and various straight rails. I decided to start by veneering the panel of MDF that would form the top. I did this by carefully shooting the edges with a jack plane on the shooting board and gluing all the edge joints together using Robert Ingham's patented tape-less joint system, as described in F&C some time ago. This creates a single sheet of veneer the size of the whole piece; all that remains is to glue it to the substrata - in my case, using an Airpress and Extramite (formerly Cascamite). My method of cutting veneers is to pass the stock slowly over the planer, taking off a cut fine enough to remove most of the teeth marks of the bandsaw after each leaf has been sawn. The newly planed surface is then presented to the bandsaw fence and the next leaf cut, and so on. 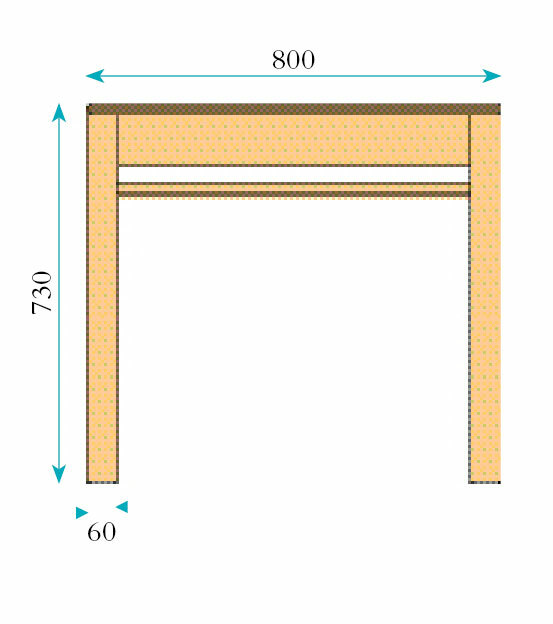 With straight-grained, predictable timber, I usually then pass each leaf of veneer through the thicknesser, supported on a board, to give a sequence of veneers of exact thickness with two flat faces. Many woods however are prone to shattering as they pass through the machine at only 3mm (1/8in) or so thick. Rather than risking this with cherry veneers, which can be rather brittle, I laid them sawn-side up. The advantage of systems such as the Airpress is that the vinyl bag accommodates itself to any irregularities caused by tooth marks, with no loss of pressure. I pressed each side of the panel separately for several hours. Extramite gives an excellent bond when veneering, in my experience, but needs to be kept under pressure for a long time, even in a warm workshop. After the glue had cured, I cut the panel to its final dimensions and glued in place the mitred frame, which forms a 60mm (2 3/8in) wide border around it, with the aid of biscuits for accurate location. At this stage I deliberately set the veneers slightly proud of the solid cherry border, which then acted as a reference surface to enable the veneers to be cleaned up to create a desk top of exact and uniform thickness. To achieve this I first used a razor-sharp try plane across the grain to level the surface quickly, followed by a meaty belt sander, then a random orbital sander to give a final smoothness. I live in dread of visitors to the workshop calling when I'm using the belt sander... It's a great tool but doesn't have much of a 'craftsmanly' look about it! Of course I could have saved myself all this trouble by simply buying knife-cut veneer, but there's a special quality about thick, sawn veneer which the ready-made, paper-thin variety can lack. Thicker veneers also have much greater resistance to damage. Moving on to the main structure of the desk, I proceeded to make a male former of chipboard with which to laminate the pair of curved rails. The radius was taken directly from the full size rod. I use two main techniques when laminating curved components - the Tage Frid method of male former, studding and pressure bars, and the other method using male and female formers. The disadvantage of the latter is that both formers must be very accurate for the technique to work, so generally I only use it when I know the moulds will be used a number of times. In this case though, because the curve was only gentle, I found that by making an outer strap of any elastic wood (ash, oak, wych elm) to distribute the pressure exerted by several sash cramps - the end result was fine. Don't forget to wax the former and the pressure strap or you might end up with one solid lump of material instead of a nicely laminated rail! Again, Extramite was the adhesive used. Titebond aliphatic resin was used for all the other various glue-ups. "Thicker veneers also have much greater resistance to damage"